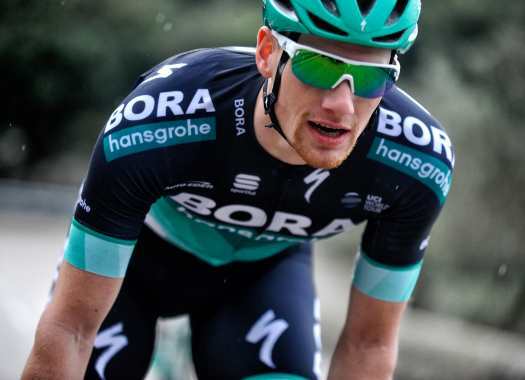 Bora-hansgrohe's Sam Bennett has taken the third position at the first stage of the Vuelta a San Juan. The chaotic final sprint gave the victory to Fernando Gaviria, while Matteo Malucelli (Caja Rural-Seguros RGA) was second. The first stage of the Argentinian race was very hot with a temperature of around 40 degrees for most of the course. The day had two breakaways and the second was caught in the last five kilometres after a final stretch in which the riders also had to deal with crosswinds. The final part of the stage was very chaotic and Bora-hansgrohe's Peter Sagan seemed to launch a very strong sprint, but the reality was that he and Erik Baska were to give Sam Bennet a last pull before the final metres. The Irishman lost the wheels of both riders and had to finish it off by himself, only centimetres separated him from the second place. "The guys put in a very strong effort all day to control the race and make sure I was well-placed for the sprint finish," said Bennett at the end of the stage. "We reached the final stretch in the front but it was very difficult for me to stay on Peter's wheel as many sprinters thought he was going to contest the stage win. It was hard to get a clear line but I was able to cross 3rd in a very tight sprint."